Simha, Sushma and Cardinal rest on the front porch, brimming in sunshine and health. PASADENA, California, September 29, 2017 — Currently, the U.S. pet food market has a value of about $25 billion a year on its way to about $30 billion by 2022. That’s some 7 million tons of wet food, dry food, snacks, treats and other pet provender produced annually by companies like Nestle, Mars, Blue Buffalo and other massive corporations. It’s big business. So when Sushma Adarkar makes her 300 pounds of dog food weekly out of her home kitchen, her herculean effort doesn’t even register as a blip on their radar. To them, she’s a fly on an elephant. But to her growing legion of followers — pediatricians, tennis coaches, Realtors, neighbors, friends, etc. — she very much exists. She’s their savior, or, to be more precise, their pooches’ pal and healer, who delivers the kind of food on a weekly or monthly basis that keeps their hounds healthy. Now Sushma hardly has to make her dog chow for a living. Her Monterey Colonial home sits on an oak-kissed acre along Pasadena’s historic arroyo, but to her it’s a calling — her pet project. She is a physician by trade and her husband Ashwin, a Stanford Business School graduate, runs a financial division for a major consulting group. 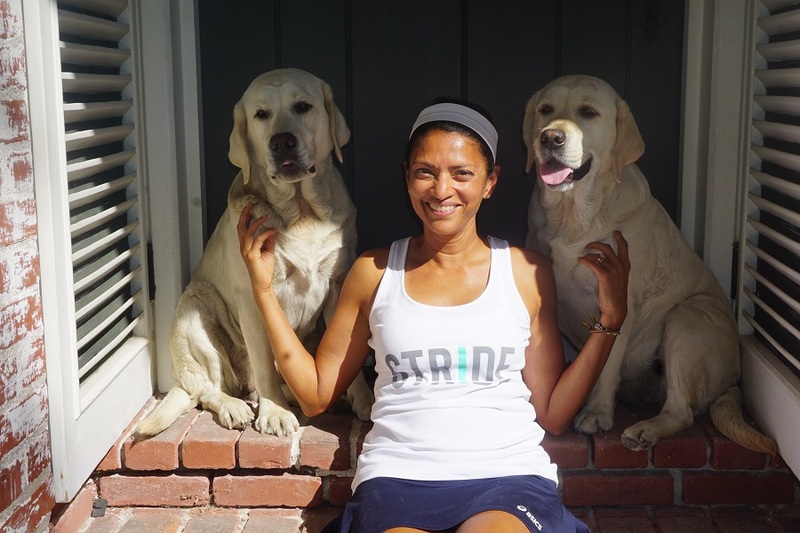 “For me, this is my mission, I really love to heal,” she said, surrounded by her two white Labradors whose names Simha and Cardinal inspired her Audi’s vanity license plate, “Simcard.” Simha is a Hindu-inspired name for a lion and Cardinal is the nickname for the athletic teams that represent Stanford, Ashwin’s alma mater. 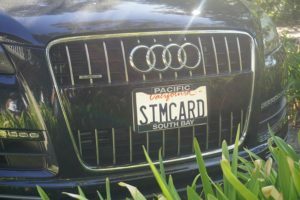 “Most people who see the license plate think I’m in the technology business,” she said. The fact that she is Indian by birth perpetuates the stereotype that she is some kind of Indian tech mogul. A sim card is a portable memory chip used mostly in cell phones. The inside joke aside, Sushma is deadly serious about being an advocate and evangelist for dogs. Growing up in Bombay, India, she never saw the kinds of doggie diseases in her native country that she sees here. “India is a poor country, dogs eat out of trash cans there, but they never get any of the diseases that dogs die from here — cancer, diabetes, heart issues and so on,” she said. But it was really only when she became the owner of two Labradors about six years ago that she became this canine crusader and pet foodie that she is today. Simha had been born the runt of the litter and almost died after contracting a rare disease called Puppy Strangles, a malady, starting with swollen areas around the eyes, that attacks the lymph nodes and eventually crushes the trachea, if left untreated. “She could have died within 48 hours,” Sushma said. Brought back from the brink after being given an aggressive course of steroids, Simha next faced a case of weeping ulcers. “The steroids had suppressed her immune system,” Sushma said, switching to her physician mode. Following her puppy pediatrician’s advice, she gave Simha a high-end dog food to nurse her back to health, but when she saw the food nutrition label listing chicken parts, chicken fat and chicken meal that were all processed together, she wondered whether she was doing the right thing. Although she was uneasy about second-guessing her vet’s advice, she decided to can the can. “I told myself I was going to go with my gut,” she said, serving them people food that she could eat herself. While Sushma has perfected her recipe, it is always slightly different and tantalizing, reflecting food’s seasonality. The warm-growing season is an excuse to feature more carrots and zucchini while more cruciferous vegetables like broccoli and Brussels sprouts find their way into her winter mix. What you won’t find, however, is any fowl, like chicken or turkey, which has been cited as one of the most common allergens for dogs. Rather, her main protein source comes from pork, which her local butcher cuts into discs for her. “He thinks I own a restaurant,” Sushma said because of her bulk-buying. She slow-cooks the pork, bone-in, for about 24 hours, which tenderizes the pork while producing a satisfying bone broth in which she cooks her vegetables. Occasionally, she will add liver to the boiling broth and then freeze the meat, which she said serves as a wonderful substitute for a meaty bone. “They absolutely love these puppy popsicles,” Sushma said. It’s no accident that Wednesday is her cooking day. That’s the day her gardener is on the grounds, so when he’s not cutting or trimming, he can help Sushma and her housekeeper lift the large kettle onto the stove. Sushma stands on a stool so she peer into the over-sized pot as she stirs the ingredients. “We need three people to lift a hundred-pound pot,” said Sushma who hardly seems to weigh 100 pounds herself due to a lifelong devotion to fitness and health that includes running, playing tennis and eating “clean.” Approaching age 50, she’s like a Mother Teresa to animals, without the wrinkles. Every week it seems the batches keep getting bigger and bigger and that’s largely because the testimonials and the people picking up her dog food weekly or monthly are growing accordingly. For example, Sushma said her tennis coach’s dog was on his last legs and not eating his favorite treats any longer when she gave the coach some of her homemade puppy chow as a last resort. The dog happily enjoyed another two years of life (14 years in human years) on his new doggie diet. Word eventually spread about the miracle along the arroyo, and now one fan of her food drives from San Diego each week to pick up her hand-crafted canine cuisine. Sushma said she has seen dogs on her food start to show positive health changes almost overnight but typically recommends that her doggie diners stay on her regimen for at least six-to-eight weeks for optimal results. She said her diet can help dogs better cope with allergies, obesity, diabetes, adrenal problems, congestive heart failure and other ailments like joint pain. Paradoxically, while the dogs tend to eat more of her food, they lose more weight. Again, the proof is in the lean, sodium-free ingredients that they consume. And dogs who have spent their lives consuming food, which is little better than mushed-up gruel consisting of hooves, snouts, beaks, feathers and other fillers not fit for humans but approved for pets, show the most dramatic improvement, according to Sushma. While dog food made of premium ingredients will cost more than the econo-crap that comes in a can, Sushma said the pay-off for her devotees/customers comes in the form of fewer, if any, vet visits that can easily run from $500 to $1,000. Pointing with pride to Simha and Cardinal, she said that as a result of their current diet, their teeth have never been cleaned and their shiny coats are flea-free. “They’re bathed only once a year, and their poop doesn’t smell,” she added. “Here, sniff the top of their heads,” she urges as further evidence of the health-giving benefits that her food provides. Oddly enough, it hasn’t been all dog nirvana for Sushma. Her husband, unlike her, wasn’t raised with any special affinity for dogs. “He didn’t grow up with so much as a goldfish,” Sushma pointed out, so putting out a lot of extra effort out to keep a couple of dogs happy wasn’t exactly in his DNA. But even he became a convert to her canine cooking after seeing her dogs thrice sprayed by skunks, with no lingering effects. “The smell rinsed right off,” she said. Sushma’s Labs eat twice a day, but she often serves yogurt with apples, bananas, raspberries or blueberries for their morning meal. That said, she noted her pets have occasionally turned gassy when workers who are currently remodeling her home have left behind a bag of Cheetos or other highly processed, fast-food snack that was innocently gobbled up. Every Wednesday afternoon, her clients pull up in front of her home, journey up her football-length walk way and exchange their empty Rubbermaid food storage container for a new one filled with fresh, seasonal offerings fit for either canine or human consumption. The price is $35 per bin. Although her process, after so many years is a self-described “well-oiled machine,” she said she frankly doesn’t know whether she’s making money or losing money. If you want to reach out to Sushma, you can email her at Sushmadarkar@hotmail.com.